Ancient Living brings to you All-Natural Handmade Soap Bars all packed in an elegant cardboard box, perfect for gifting purposes. Infused with essential oils and natural ingredients, these organic bathing soaps calm and soothe your skin and feature delightful fragrances that will surely freshen your mood. Luxury handcrafted soaps have a high percentage of nutrient-rich oils such as Golden Jojoba, Wheatgerm, Shea butter, Olive and natural Almond oil. Natural aroma oils and exotic Ayurvedic herbs add a multitude of benefits. 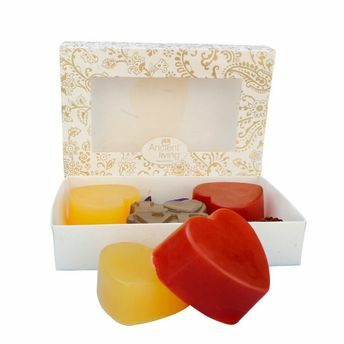 Natural essential oils in the soaps not only uplift the senses but also promote skin health by regenerating, energizing and moisturizing the skin.